There's no shortage of terrain to ski in the Rollins Pass vicinity. Bix Firer scopes his line before dropping in. A pleasant tour through the trees still offers some excitement. 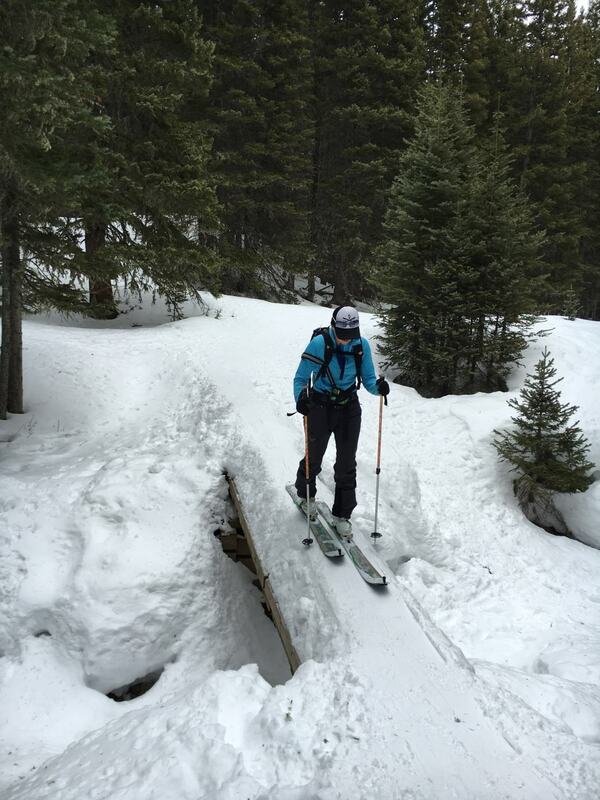 Tricia Boomhower expertly navigates a narrow, snow-covered bridge—it's trickier once the skins come off. You don't have to make it all the way to 11,000 feet for high-quality skiing—these pillows are begging to star in your next ski film. The skin track is about 3.5 miles each way; rack up additional miles by skinning farther back into Rollins Pass, exploring the lakes in the alpine valley, or ripping a couple of laps. The tour from the trailhead at Moffat Tunnel to treeline is about three miles each way. You'll gain 2,000 feet of vert in that span, so it's not particularly strenuous—the trail gains elevation gradually, punctuated by occasional short, steep sections. Around 11,000 feet, you'll catch sweeping views of the James Peak Wilderness, and the run possibilities are endless. 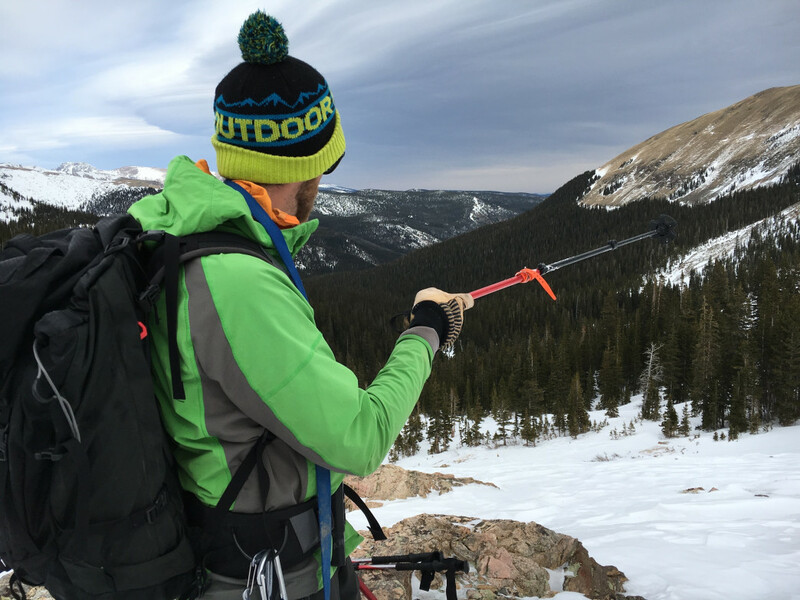 Some low-angle terrain exists, but above treeline, you're mostly either in avalanche terrain or its runout, so good terrain management, rescue gear, and the knowledge to use it is essential. Rollins Pass is high—11,676 feet at its summit—so it holds snow in the early and late season. Winds gust hard year-round, so be prepared for variable snow conditions until warmer spring temps turn the snowpack isothermal. Parking at Moffat Tunnel, where the road dead-ends, is free. Resist the temptation to approach the tunnel, which is on private property. For those who like their backcountry touring served with a side of history, Rollins Pass—just ten miles off the Peak-to-Peak Highway—is a treasure trove. Park at the East Portal of Moffat Tunnel, which burrows under the Continental Divide, and follow the well-trodden skin track up its gentle climb to treeline. From here, the possibilities are endless: when conditions are good, rip laps down steep couloirs or head up to the Rollins summit; on days with high avalanche danger in the forecast, stick to low-angle trees for guaranteed fun. The East Portal of Moffat Tunnel—which offers passage both for trains and much of Denver’s water—doesn’t look like much when you pull into the parking area, but its ascetic exterior belies Herculean effort: thanks to worse-than-anticipated geologic conditions, constant cave-ins (including one that resulted in the deaths of six construction workers in 1926), and occasional flooding, each of its six miles through the Continental Divide required over a year of construction. 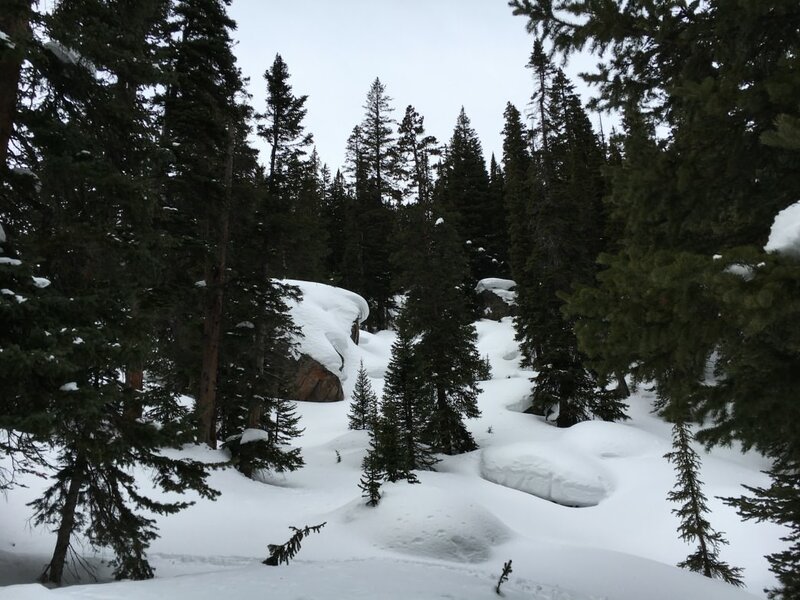 The tracks emerge from the West Portal almost directly onto the slopes of Winter Park, but there’s no need to hop a train for quick access to drool-worthy tree runs: Rollins Pass has that, too. The skin track, shared with snowshoers and no shortage of off-leash dogs, climbs 2,000 feet in just over three miles. It’s gently graded most of the way, but if the intermittent steep climbs get your heart rate up, just think of the 1.4 million tons of rock moved during the five years of Moffat Tunnel construction—by the time you’ve dredged up that number, the trail will have flattened out for a breather. When you reach treeline, just above 11,000 feet, pause for sweeping, panoramic views of James Peak and adjacent Indian Peaks Wilderness, but don’t linger too long—steep couloirs and perfectly spaced trees await. This tour is best suited to skiers of at least intermediate ability; though the trees are mostly very low-angle (think fifteen degrees or less), it requires some control to maneuver down the skin track without hitting trees or other users. Above treeline, runs steepen out, and the trail often crosses avalanche runout zones. Skiers should check the daily avalanche forecast, practice diligent terrain management, and always carry and know how to use rescue gear. From Denver, you can avoid I-70 altogether. Take 6th Avenue west into Golden, where it turns into CO-93. Follow CO-93 to CO-72, where you’ll head west on Coal Creek Canyon Road for just under twenty miles. From here, take a left onto CO-119, and follow it for two miles to the Portal Road turnoff in tiny Rollinsville. Portal Road is unpaved and crosses the train tracks several times. It dead-ends at the East Portal of Moffat Tunnel. The drive is just over 50 miles and takes about an hour and a half. It’s free to park here, and two vault toilets are available on the west end of the parking lot. All users should pack out trash to avoid conflicts with the land manager and keep access to Rollins Pass open.